The barnacle plots at White Point consist of Chthamalus dalli/fissus (note that species were not distinguished until 2001) and Balanus glandula with separate plots (5 of each) designated at this site based on dominance of each genera at the time of setup. While the initial approach was to analyze these as separate assemblages, a latter decision was to treat all ten of these collectively as “barnacle plots” since the two genera were lumped during data collection. 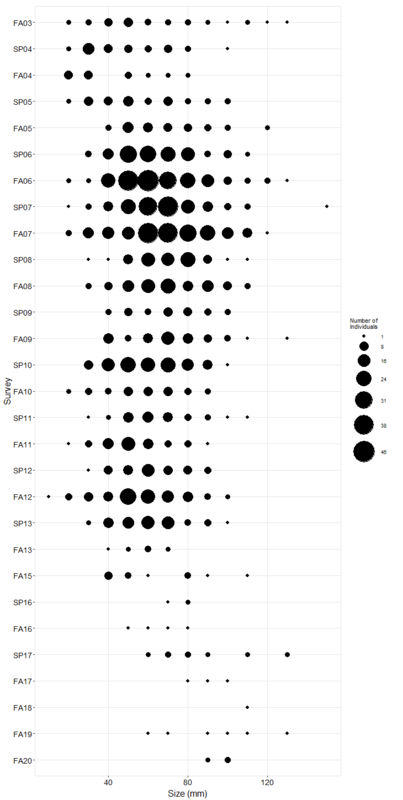 Thus, within these ten barnacle plots, barnacle cover has declined gradually throughout the monitoring period with one episode of precipitous decline and recovery in the late 1990's and another dip in cover in 2009-2010. Recordings of bare rock shot up during that former period and have remained high ever since. In addition, the cover of red algae have gradually increased throughout the years and have begun filling in the plots as barnacles declined. In the earlier years, a single red alga was responsible for this increase which has been loosely identified as a very low growing form of Mazzaella affinis characterized by very small bladelets thickly emerging from a crustose base. Initially, this M. affinis carpet spread into the a significant portion of a single plot with a second plot impacted to a lesser extent. But in recent years those patches have grown and all plots have been invaded to some extent. And in 2002, the newly introduced and invasive alga, Caulacanthus, began spreading into these plots, initially growing atop the M. affinis carpet and then spreading further into the plots. These plots seem to be experiencing a slow transition toward an algae dominated state. Motile invertebrate counts at this site began seasonally in the Spring of 2001 (with littorines added the following fall) and were changed to annual sampling in 2004. Both limpets and littorines have been abundant in the barnacle plots with up to 500 or more individuals per plot in some sampling events and high variation generally. Neither species has shown variability tied to species cover in the photoplot sampling. Mussels cover in the mussel plots remained high and largely stable in most years until 2006 when it dropped steeply from the 80% or greater range down to around 50% by 2008. After that a moderate rebound occurred with mussel cover leveling out in the 60 to 70% range through 2010 and then plateauing closer to 80% through 2013. In 2014, another precipitous decline was observed with mussel cover being halved to 40%. Two plots were largely responsible for this latter decline having undergone partial to complete mussel breakouts, presumably as a result of strong winter storms. However, mussel bed contraction has also been a factor at this site, albeit less severe than at other sites in southern California such as Point Fermin and the Orange County sites. In general, the beds at this site are characterized by tightly packed monolayers of small to medium sized mussels interspersed with bare patches. In some plots, and in portions of mussel beds across the site, mussels are covered by a layer of epiphytic Caulacanthus that is thick enough to obscure the mussels completely in places. It is unknown wheter Caulacanthus might be contributing directly to mussel mortality, but the spread of this species could certainly be having an influence on mussel recruitment and bed replenishment locally within this site. The data from the motile invertebrate sampling show that limpets are common in the mussel plots in the range of around 100 individuals per plot in most years. Nuttalina sp. chitons and littorines are also present in these plots in low numbers. The infrequency of snails in these plots is notable, though Nucella snails are occasionally found in low numbers. 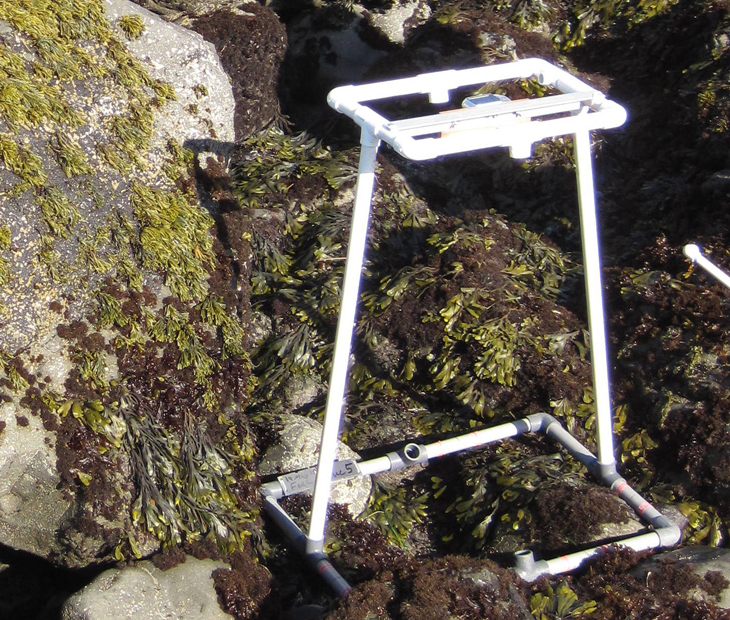 Sampling of limpets and littorines in mussel plots ceased in 2014. Within the turfweed plots, Endocladia cover is seasonal (higher in spring, lower in fall) and has declined from the 70 to 80% range found in initial years of sampling to around 40 to 50% in most years since. Cover dropped below 20% in the spring of 2007 but rebounded soon thereafter. Barnacles and bare rock have generally, but imperfectly, trended inversely to Endocladia cover. And red algae cover, which in this case is almost entirely comprised of the exotic species Caulacanthus ustulatus, has been increasing in the turfweed plots since the early 2000's. This alga has invaded many of the available microtopographic lows within these plots while Endocladia has been more successful in retaining the higher ground. Motile intertebrate counts within the turfweed plots depict a high abundance and a high variability of both limpets and littorines. Sea star (Pisaster ochraceus) plots were added to this site in the fall of 2003 and consist of three large irregular plots surrounding an area of medium relief rock which includes several large cracks and ledges. The initial samples yielded just under 50 individuals each. Then abundance increased considerably in 2006 and 2007 to a high of around 200 seastars followed by a drop to basal levels in 2009. Subsequent peaks of around 100 stars each were observed in Spring 2010 and Fall 2012. 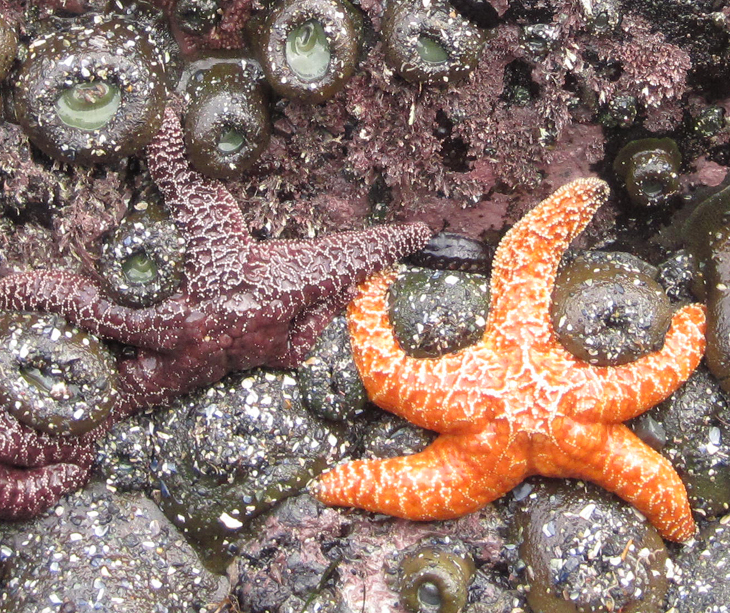 The seastar wasting disease arrived at this site in the fall of 2013. During that sampling event, just a couple stars were observed and each of those was heaviliy lesioned or missing rays. Another solitiary ray was found with no associated seastar body. Following that season, no stars have been found at White Point, either in the fixed plots or sitewide. Recruitment has been common at this site with seastars in the 50mm or less range found in most seasons. It appears that a large recruitment event was at least partially responsible for the 2006-2007 increase. However, stars in the larger size classes are generally rare at White Point which may be the result of high, and largely unregulated, human visitation, species manipulation and harvesting at this site.